We think everyone should have more long weekends. Arrive Friday. Depart Monday. Save 50% on Sunday. Offer valid for reservations made in advance between 04/01/2019 and 06/30/2019 for stays from 04/01/2019 through 06/30/2019 at Hyatt Union Square New York. Must request offer code Stay2 at time of booking to qualify for discount. A limited number of rooms are allocated to this offer; reservations subject to availability. Offer not valid with groups, conventions, other promotional offers, tour packages or special rate programs. Rate is per room, per night, based on double occupancy and excludes service charges, mandatory resort fees, applicable taxes and other incidental expenses. Additional charges may apply for additional guests or room type upgrades. Guests arriving on Thursday night who book this offer, and stay 4 nights receive their Sunday night rate at 50% off. Offer valid for reservations made in advance between 05/01/2019 and 07/31/2019 for stays from 05/01/2019 through 07/31/2019 at Hyatt Union Square New York. Must request offer code Stay50 at time of booking to qualify for discount. A limited number of rooms are allocated to this offer; reservations subject to availability. Offer not valid with groups, conventions, other promotional offers, tour packages or special rate programs. Rate is per room, per night, based on double occupancy and excludes service charges, mandatory resort fees, applicable taxes and other incidental expenses. Additional charges may apply for additional guests or room type upgrades. In honor of the first-ever WorldPride event in the U.S., we’re proud to offer a summer of special rates. Use code EQUAL at Hyatt.com to receive an exclusive discount at these participating hotels: Grand Hyatt New York, Andaz 5th Avenue, Hyatt Place New York/Midtown South, Hyatt Centric Times Square, Hyatt Herald Square, Parker New York, Hyatt House New York/Chelsea, Park Hyatt New York, Hyatt Union Square, Andaz Wall Street, Hyatt Regency Jersey City, Hyatt Place Fair Lawn/Paramus, Gild Hall, The Beekman now taking reservations for WorldPride NYC. Offer valid for reservations made in advance between 04/15/2019 and 06/21/2019 for stays from 05/23/2019 through 09/09/2019 at participating hotels. Must request offer code EQUAL or LGBTQ or PRIDE at time of booking to qualify for discount. A limited number of rooms are allocated to this offer; reservations subject to availability. Offer not valid with groups, conventions, other promotional offers, tour packages or special rate programs. Rate is per room, per night, based on double occupancy and excludes service charges, mandatory resort fees, applicable taxes and other incidental expenses. Additional charges may apply for additional guests or room type upgrades. Book a premium room or suite and treat yourself to a $75 hotel credit per day, Premium wireless high-speed internet access per day and two complimentary cocktails per stay. Offer valid for credit per day that can be applied against $75 food & beverage credit. Offer valid for reservations made in advance between 04/15/2019 and 07/15/2019 for stays from 04/15/2019 through 07/15/2019 at Hyatt Union Square New York. Must request offer code RTREAT at time of booking to qualify. 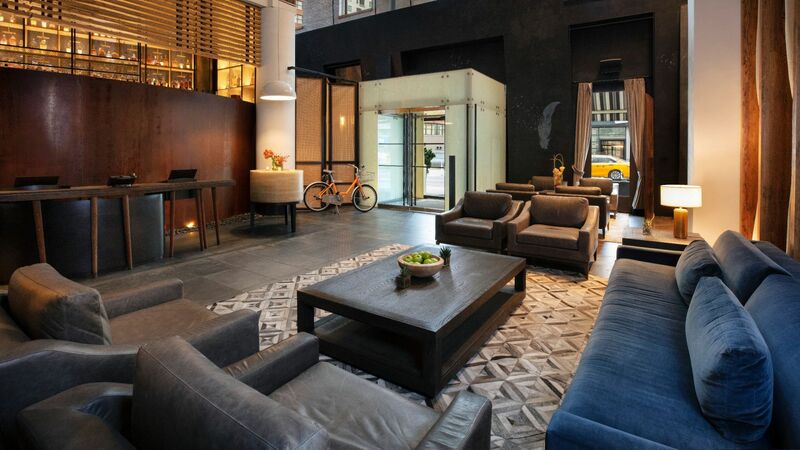 Credits must coincide with guest’s stay at Hyatt Union Square New York. All guests must be at least 21 years of age and/or of legal age to consume alcohol in the jurisdiction where the hotel is located to receive alcoholic beverages. No credits may be used towards alcoholic beverages. A limited number of rooms are allocated to this offer; reservations subject to availability. Offer not valid with groups, conventions, other promotional offers, tour packages or special rate programs. Rate is per room, per night, based on double occupancy and excludes service charges, mandatory resort fees, applicable taxes and other incidental expenses. Additional charges may apply for additional guests or room type upgrades. Guest is responsible for all charges not included in package. No refunds for any unused portion of package. No substitutions nor replacement services or products offered for package inclusions. A portion of the rate for this offer may reflect taxes, service charges, gratuities, and third-party charges for certain included items, and those costs are not eligible for World of Hyatt® points.